The year is AD 7000. The human species is extinct for the fourth time due to its fragile nature. Krina Alizond-114 is metahuman, descended from the robots that once served humanity. She's on a journey to the water-world of Shin-Tethys to find her sister Ana. But her trip is interrupted when pirates capture her ship. Their leader, the enigmatic Count Rudi, suspects that there's more to Krina's search than meets the eye. He's correct: Krina and Ana each possess half of the fabled Atlantis Carnet, a lost financial instrument of unbelievable value capable of bringing down entire civilizations. Krina doesn t know that Count Rudi suspects her motives, so she accepts his offer to get her to Shin-Tethys in exchange for an introduction to Ana. Charles Stross, born in 1964, is a full-time science fiction writer and resident of Edinburgh, Scotland. 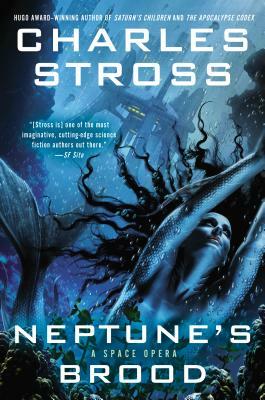 The author of six Hugo-nominated novels and winner of the 2005 Hugo Award for best novella ( The Concrete Jungle ), Stross has had his work translated into more than twelve languages. He has worked as a pharmacist, software developer, and tech-industry journalist."